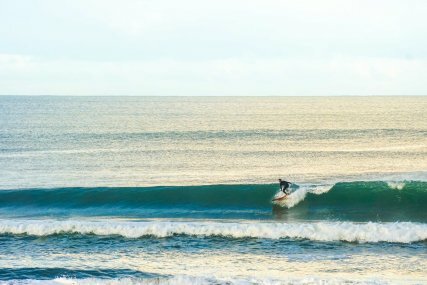 Surf n Stay offers exciting travel experiences involving surfing packages and hostel accommodation at Whangamata on the Coromandel Peninsular of New Zealand. Our location allows countless opportunities to explore impressive scenery and unique cultural experiences within a popular kiwi travel destination. We offer a onsite Surf School for everyone and every level, for kids & adults, families, women, students and corporations. In the peak summer period we are at our front beach location in Williamson park with the surf school running lessons 4 times in the day. We are located just a short stroll from the beach and hire high quality equipment for surfing, kayaking and Standup paddleboarding, all year round. We also Guide kayak tours to Donut island an amazing sunken island with a hidden beach inside, just a paddle off the coast. Our Surf Camp provides accommodation at our comfortable beach house for all travelers with in a friendly environment , come hangout with us! The welcoming surf town of Whangamata, with its large main beach is set against a backdrop of native forest park. The waves at this large beach break offer perfect conditions for surf beginners to learn in gentle, yet consistent waves. When the famous surf break at the left of the bay named ‘The Whanga Bar’ is on, it creates a beautiful, long left hander, starting with a steep drop in, a long barrel section and a nice, long wall. Ashore lie Clark Island and Donut Island which can be reached by kayak or stand up paddle board. The Coromandel peninsula is steep and hilly and is largely covered in temperate rainforest. Just inland from the town, the Coromandel Forest Park is the place for hiking, mountain biking and hunting and the beautiful Wentworth waterfall is close by. To get here from the Auckland airport takes one and a half hours. The Beach Side Unit is our premium studio accommodation designed to accommodate up to 4 people. With a comfortable queen size bed, 2 singles, a private bathroom plus under cover outside area, it is ideal for families, couples or a group of friends that want to be a short one minute stroll away form the beach or just five minutes to town. The studio features its own dining table, mini grill, hot water jug and free wifi. Guests also have full use of the communal kitchen and BBQ facility. The Drifter shared room consists of 4 single beds set as bunks. Beds are sold separately making this an affordable option for the solo traveller. Drifter dorm bunks are spacious allowing guests to sit comfortably on the bed whilst relaxing with a good book or perhaps planning your next big adventure with the use of our free wifi. Guests also have full use of the communal kitchen and BBQ facility. The Whangamata Bar Dorm consists of 6 single beds set as bunks. Beds are sold separately so that the solo traveller can choose a cheaper backpackers option. Whanga Bar Dorm bunks are spacious allowing guests to sit comfortably with a good book or use our free wifi to plan your next big adventure. 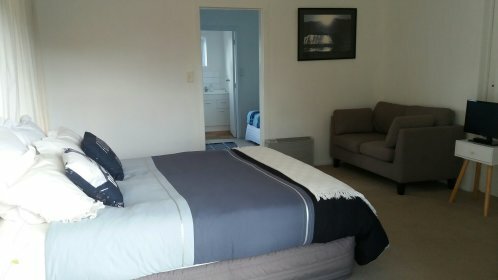 The Soul Rider single room accommodates solo travellers or workers looking for more privacy while in Whangamata. With a comfortable single bed, this room allows guests to have a good nights sleep after a fulfilled day. Guests have full access to the communal living, eating and bathroom areas. We provide surfboards, wet suits and certified Surf Instructors with years of experience. Each lesson is 2 hours long. Our beach break is a perfect starting point, with long rolling waves ideal for learning the basics of surfing. Kat and Mauro teach surfing with a great passion for the sport and the local community and run the Surf N Stay, Adventure hostel and surf school in Whangamata. Happily assisting surfers and visitors from all around the world to experience this beautiful part of the world, with its fun surf breaks and natural wonders to explore.